According to reports, a young boy called Boris Kipriyanovich, who lives in Russia’s Volgograd region, reincarnated Indigo Child. His knowledge and skills have fascinated not only his parents but researchers who have studied the young boy. Boriska’s mother claims the boys knowledge of the universe is fascinating. Ever since Boriska (his nickname) was four years old, he was used to visiting an anomalous zone referred to as Medvedetskaya Gryada, which a small mountain in the vicinity of Zhirinovsk, where the boy lives with his parents. His parents stated that their child needed to visit the zone regularly in order to fulfill his needs for natural energy. While the story might sound fascinating and unbelievable to some, his parents, well-educated people are in fact worried about the incredible talents their son possesses. They are afraid as to how society will accept Boriska when he becomes an adult. Boriska’s mother, a local doctor, noticed how special Boriska was since he was a baby. 15 days after birth the young child could hold his head without aid. He started speaking a few months after birth when he pronounced the word ‘baba’ after which he started pronouncing more difficult words with ease. When Boriska was only one and a half years old, he began reading and at the age of two, the young child could already draw and paint shortly after. His talent and amazing skills were noticed soon after he started attending the kindergarten when tutors notice his incredible writing and language skills and fascinating memory. However, his parents state that Boriska has obtained further knowledge from a source they say out of this world. As the boy grew older, his fascination with space became a permanent subject of discussion. 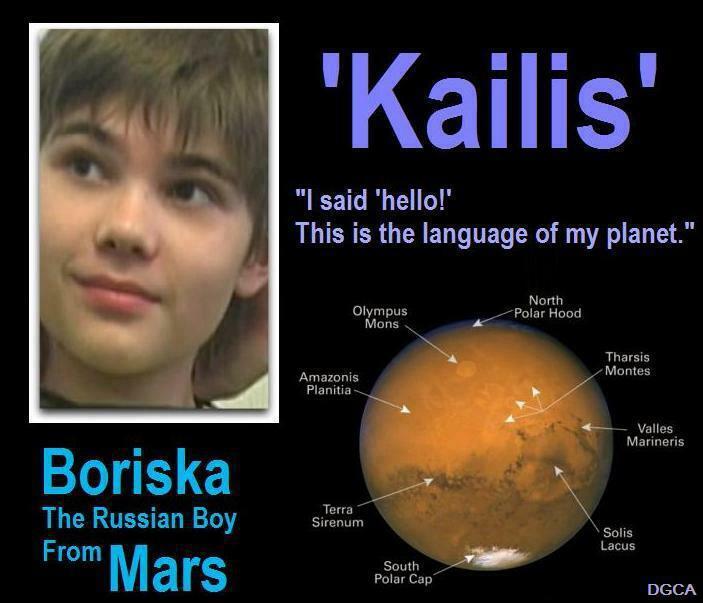 On one occasion, the boy spoke about how he lived on Mars in the distant past. Boriska went on to say that the red planet is still inhabited today, even though the Martian atmosphere suffered catastrophic damage in the past. Boriska went on to say that the Martian civilization inhabits cities located far beneath the Martian surface. The story is even more fascinating, and many people find it hard to believe the more they read. According to Boriska, in the distant past, he used to be a pilot and traveled to planet Earth frequently during the time the Ancient Lemurian civilization inhabited Earth. According to his parents, the boy speaks of the Lemurian civilization and their existence as if it were yesterday. Boriska says the ancient Lemurian civilization vanished because they failed to develop their society spiritually which eventually lead to their downfall. Boriska’s fascination with lost civilizations and space in beyond fascinating according to his parents. His interest in diverse subjects increased when his mother gifted the young boy a book called “Whom We Are Originated From” by Ernest Muldashev. His parents say that the young boy could spend hours looking at the drawings of the ancient Lemurians. According to his mother, Boriska states that the Lemurians inhabited Earth 70,000 years ago, and were massive beings, which grew nine meters in length. The boy’s mother was not sure what to think, whether the child’s imagination was over-developed or if there is a small possibility that what he was telling was the actual truth. Boriska went on to say that there are great discoveries still waiting to be made on our planet. The boy says that a massive knowledge database will be found underneath the Great Pyramid of Giza. He added that more knowledge will be found under another Pyramid yet to be discovered. “The human life will change when the Sphinx is opened, it has an opening mechanism somewhere behind the ear; I do not remember exactly,” he said. His parents and those who have had the opportunity to speak with Boriska say he has extreme knowledge of space and different dimensions. He possesses knowledge of Interstellar spacecraft and talks about that as if he was an expert. He has even drawn numerous UFOs and explained how they function.